Now that I’ve played all there is to play of Mario Kart 7 for the Nintendo 3DS, I can say without any bias one way or another; it’s a Mario Kart game. That’s not to say it’s bad at what it does, but for a genre that is pretty stale, it adds a few new wrinkles to the series while satiating the retro reminders of past games. If you’ve never played Mario Kart before, then you are one of the few gamers who can make that claim, but let’s sum it up anyway. Nintendo “carefully” selects the most famous characters from games Mario has appeared in and pits them against one another in a kart-racing battle to the death. Well, it’s more like to the pain. Especially when you play locally with friends who have active fists when they lose. Mario Kart has been known to employ a very generous rubber-banding device so, even if you are in last place, you will still have an opportunity to win. The game gives you the rarest and most powerful weapons when you fall behind the leader, so it’s somewhat easy to make up that ground. It might not be fair, but good karters can snap the rubber band before it slingshots your opponent past you. I won’t share my secrets. Speaking of weapons, Mario Kart 7 has added a few new weapons to the overall arsenal. The fire flower makes its first appearance in a Mario Kart game and allows the player to expectedly shoot fireballs at the other drivers. Another edition is the super leaf. A carryover from its reintroduction in Super Mario 3D Land, the super leaf gives the driver a tail to whip away oncoming projectiles. It’s especially helpful towards the end of races when an opposing driver fires that dastardly red shell. The last of the new weapons is called Lucky 7. When a player gets this power-up, it forms a circle of seven random weapons around the kart. Quite useful, especially if you are in last place. There are only 8 drivers total in the race so you do the math. Mario has a hang-glider now. No cape or tail required. For the first time in the Mario Kart series, tracks now feature airborne and underwater sections. If you hit a sick jump, a hang-glider will automatically pop out of the kart and you will glide to a lower section of track. Though the control of the kart changes, it’s not that difficult of an adjustment, particularly when you don’t stay in the air that long. The underwater sections turn your kart into a submarine of sorts and again, the control changes slightly. You still race on a flat surface at the bottom of the water but the kart tends to get a little floaty…no pun intended. Another first-time feature is the ability to race in a first person perspective. 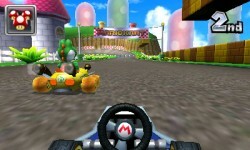 Using the accelerometers in the 3DS, you control your kart as you tilt to steer. Unfortunately, you lose out on the ability to drift for the mini boosts like you can in other modes. Another downside I’ve found while trying to play this mode is that it is damn near impossible to have the 3D slider turned up at all. If you are constantly moving the 3DS, your eyes are continually readjusting to the parallax screen and it is aggravating. Because of that, I rarely play in first person perspective. Though the 3D is annoying in first person mode, it is extremely well done if you play Mario Kart the old-fashioned, third-person way. I never found any eye strain or headaches associated with my play time and I’ve come to enjoy the 3D visuals way more than having the slider turned down. I’m still amazed at the technology and the fact that I don’t have to wear glasses to utilize it. I’ve only played first party releases on the 3DS so I can’t say whether or not the good 3D visuals are the norm or the exception. All I can say is that Mario Kart has exceptional visuals even in a somewhat tired genre. While online multiplayer might not be new to the franchise, it definitely is well implemented on the 3DS. Players can compete against random players online (no archaic sharing of friend codes necessary), players in their friends list, or “rivals” they have raced against previously. Historically, Nintendo has been bad at this and, though it is still not perfect, it is much easier to get an online game going than I have come to expect for a Nintendo game. Online multiplayer creates a bigger sense of challenge than racing against the classic characters over and over again. The one downside to online multiplayer in a Mario Kart, the ability to physically punch your opponents, has been drastically reduced. I have yet to run into any difficulties racing against people from around the world. The game runs at a crisp framerate while racing with 2 to 8 players. The ability to exchange ghost data with friends adds that extra challenge seen in most addictive time trial-based games. Overall I was impressed with the multiplayer implementation and hope Nintendo can learn from this as it moves forward. Neat but unnecessary mode. Especially if you like it in 3D. I am both simultaneously happy and disappointed with the track selection Nintendo and Retro Studios have included. There are 16 new tracks and 16 tracks from the previous games. 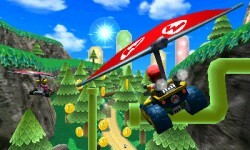 While I shouldn’t be complaining about 32 tracks in a Mario Kart game, only the 16 new tracks really utilize the hang-gliding and underwater elements to their full potential, yet, I love the fact that some of my old favorites like Koopa Troopa Beach and Rainbow Road from the previous Kart games are playable. Even some new tracks from the Wii version that I didn’t play are becoming some of my favorites. I guess overall I’m pretty satisfied, but I’d love to see the next Mario Kart game with 32 new tracks. Like I said before: it’s a Mario Kart game. If you enjoy the series and aren’t tired of the same gameplay with a few added elements, then you’ll be satisfied with the release. The excellent 3D and new gameplay implementations did it for me, but I haven’t played much Mario Kart since Double Dash and we all know how much of an abomination that was. There aren’t a ton of good to great games on the 3DS right now, so I definitely recommend you pick this one up if only to hold you over until something else comes along. Did you really just call Double Dash an abomination?